When customers visit your client’s site, it’s not uncommon for them to leave without following one of your calls to action.Whether that’s an email sign-up, download or purchase. Visitors who leave your client’s site without completing their goal don’t have to disappear forever! But that’s common knowledge, right? The aim of any social media marketer is to drive people back to the website, inviting them to complete a goal. Think about it: We use paid social advertising to drive link clicks, sales and brand awareness through the roof. You can do that through retargeting audiences on Facebook, following site visitors by their virtual footprint. The best part? This practice has been proven to receive better results than traditional forms of social advertising. 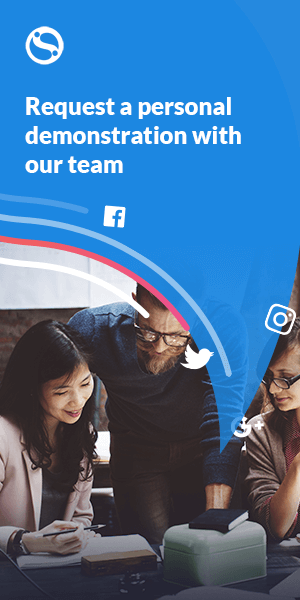 You could land yourself in your client’s good graces by embedding it into your paid social strategy. Visited This Page - for any eCommerce business. Abandoned Basket - for online retail shops with a focus on sales. People Who Engage with Your Page - for businesses with a large organic following on Facebook. All Site Visitors - for businesses with larger, frequently-visited websites. Previous Purchasers - for businesses with a huge customer database, filled with their ideal customer. 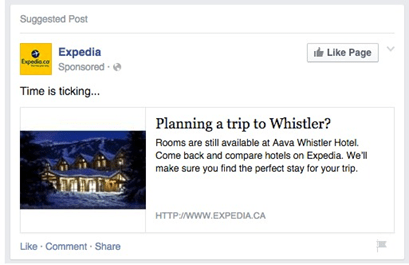 Why focus on retargeting on Facebook? If you’re reading this and thinking, “There are hundreds of places I could retarget my customers, including paid advertisements in search and on-site. Why Facebook?”, hear me out. Facebook retargeting has been proven to get better ad results, including increased ROI. This means that less money is spent, but more profit is gained. It’s the holy grail metric that any social advertising campaign should aim to increase. The social media platform is excellent at boosting ROI because the success of Facebook ad campaigns revolves around relevance score. This metric, scored on a scale of 1-10, gives advertisers a rough idea on how relevant the ad is to their audience. Facebook will show ads that reach the higher end of the scale to more qualified leads, hence a better ROI. If you are using retargeted ads, you’ll automatically have the best chance of receiving a high relevance score. You'll be targeting people who already know you and your brand, and re-engaging with them based on their on-site actions! Before we rush into creating audiences within your Facebook advertising account, we’ll need to make sure the foundations are in place. 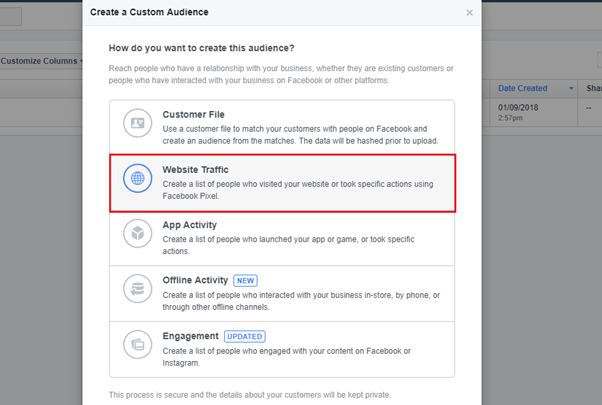 The Facebook pixel tied to your client’s ad account will need to be installed – preferably a few weeks before your retargeting campaigns begin. This pixel can be set-up to track specific events, such as page views, purchases and search terms. 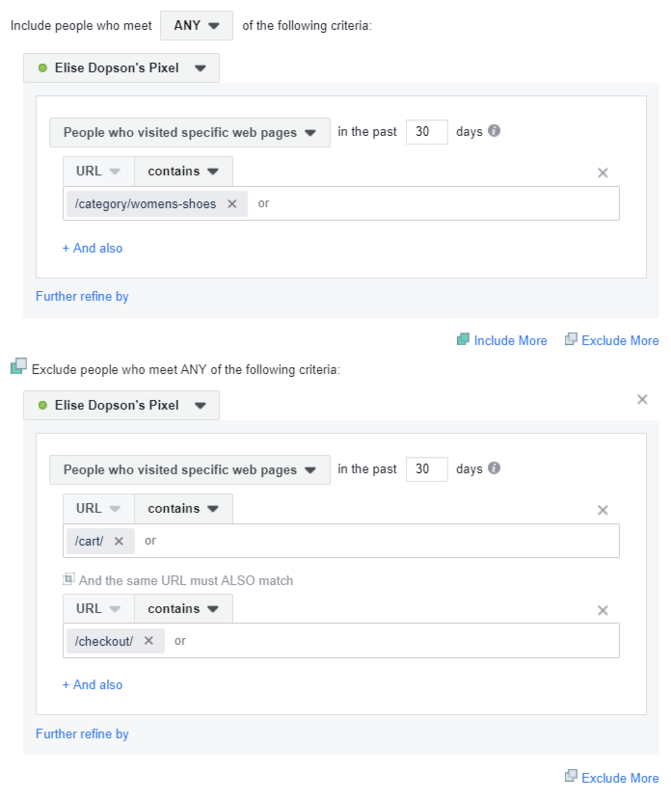 When a person visits a designated site and completes an 'event', Facebook will collect their information and connect their habits to a Facebook profile wherever possible. This allows you, as an advertiser, to retarget the people who’ve completed specific things on your website through Facebook ads. You can find your Facebook pixel by heading to the Pixels tab in Facebook Events Manager, or navigate to the full set-up instructions. Now that your pixel is set-up and tracking customer behaviour on your client’s site, we can move onto creating ads that drive them back on-site to complete a goal. Take a look in Google Analytics and find the page on your client’s site which has the most views. The chances are, this will be your homepage or a category page. You should be retargeting people who’ve visited category pages without making a purchase. But how do you find the people who match these criteria, and exclude people who have visited and purchased? 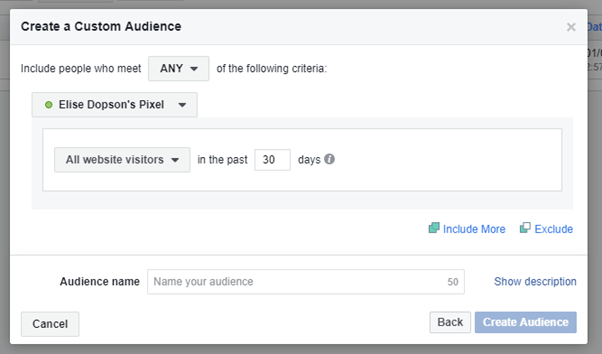 Enter: Facebook’s Custom Audience builder (aka your new best friend). Head over to the Audiences tab, then select “Create Audience” > “Custom Audience” from the drop-down menu. On the next page, you’ll be able to enter the URL of the page visited by people you want to retarget. Click the dropdown arrow in the first section of your audience creator form and select “People who visited specific web pages”. In the text box below this, add the URL (or part of it) that you want to retarget visitors from. While doing this, you’ll need to exclude people who’ve already purchased. Showing them an advert for something they’ve already bought could be waste of time, effort and, more importantly, money. You can prevent showing ads to previous purchasers by excluding people who have also visited the purchase or checkout page. Press the ‘Exclude’ button towards the bottom right-hand side of your box and follow the same steps outlined above. The only difference here is that we want to exclude anyone who’s visited the 'Cart' or 'Checkout' page on your site. You could take this remarketing tactic a step further by using this data for your ad text and image. This method of audience retargeting will help to drive down your cost because it’s relevant to the user. Why? Because they’ve already expressed interest in the page you’re advertising, which may mean they’re more likely to click. When using audience targeting, WordStream's CPC was $0.49 for the Larry Kim's post. Compared to the average CPC for a Facebook Ad of $1.72, using the retargeting option will boost your ROI and bring down your advertising spend. Did you know that on average, online retailers miss out on 69.23% of their sales due to users abandoning their online basket? Luckily, you’re able to use Facebook ads to retarget these potential customers, and drive them back to your site to complete their purchase. Cart abandonment can happen for many reasons – not solely because the person changed their mind. They could be too busy to checkout at that time and forget to return, or waiting for a coupon code to get money off their order. Whichever reason they didn’t complete their purchase, you can remind your audience to do so by using the Abandoned Basket retargeting ad. To do this, you’ll need to upload a product catalog to your advertising account. This lists every product on your website, alongside details such as the price, stock availability and colour. All products – if you want to retarget people who’ve visited any product page on your site, without purchasing. 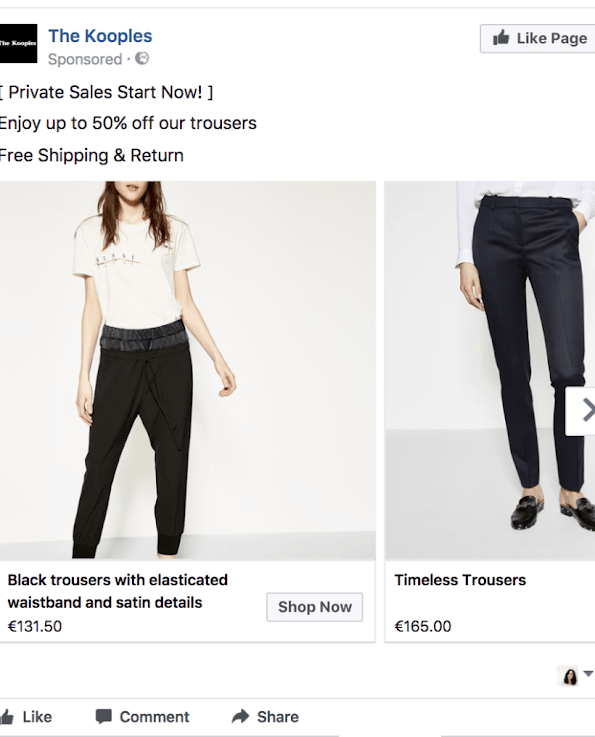 Product lists – if you want to retarget people who’ve visited a certain selection of products on your site, without purchasing. Then, finish creating your ad by adding text and headlines. 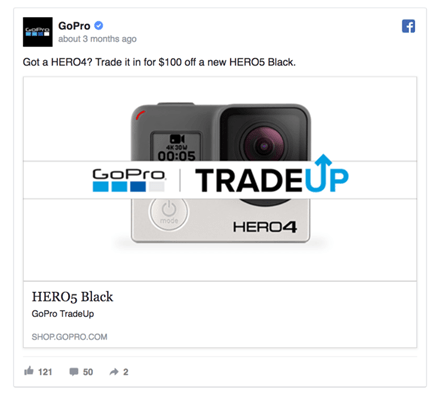 Once published and running, Facebook will show the same products that someone previously added to their online basket, but didn’t purchase. People within this audience segment will be higher up the sales funnel. They’ve taken an action to prove they’re interested in your product, but just need a little push to convert. Over a quarter of users return and complete the check-out process if they've been retargeted, compared to just 8% without retargeting. That’s why Abandoned Basket ads have some of the highest conversion rates. You could be missing out on a huge number of sales without incorporating this remarketing audience into your strategy! Think about the number of people who like your business’ Page on Facebook. The chances are, you’ll already Facebook fans that you could retarget – and potentially more who regularly engage with your organic Facebook content. These people have gone out of their way to like your page, making them loyal fans. 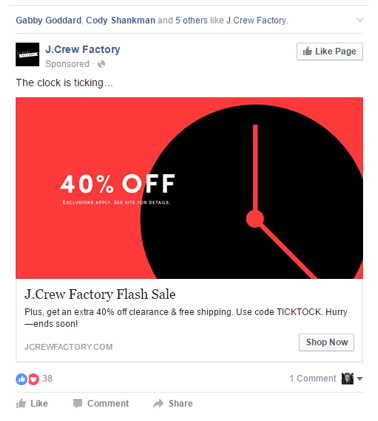 Don’t be fooled by thinking that even if they’ve purchased from you before, you shouldn’t be retargeting them through Facebook ads! To start off, I’d recommend using the “Everyone who engaged with your Page” setting. 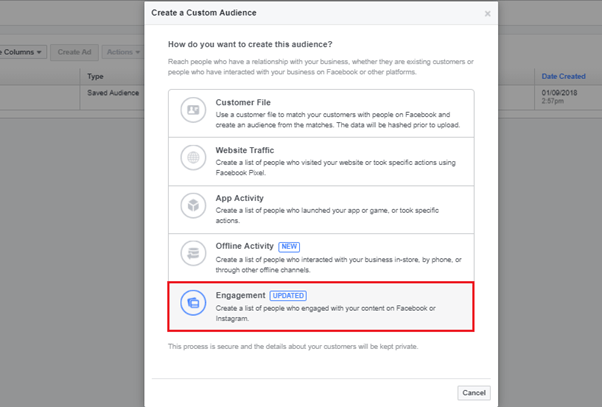 This way, you can get a grip on your current Facebook audience, and learn more about their average stage in the sales funnel. If you begin to notice higher conversion rates from this retargeted audience, dive deeper and break down your audience through the other settings. 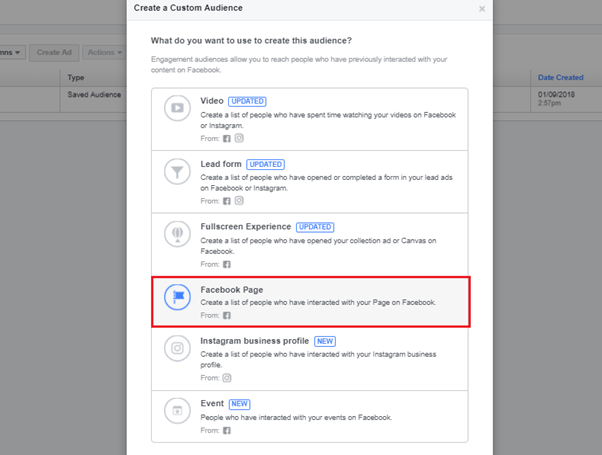 That way, you’ll be able to discover which Facebook actions are more likely to lead to a conversion when retargeted through ads. Even if you don’t have the same site traffic levels of Google, you’re still likely to have people who visited your site without doing anything at all. Although these people could be considered as ‘colder’ leads, it’s still worthwhile targeting them. Why? Because they landed on your site. Whether that’s through coincidence or they got too busy to browse around, bringing them back could lead to a conversion! You can create this audience by heading back into your Audience section, and selecting ‘Website Traffic’. If your site receives minimal daily traffic, consider increasing the day range to 60+ days. That way, your audience size will be large enough to run an advertising campaign. When using this audience to promote your content on Facebook, be general. Remember that these people haven’t shown interest in a specific product or category, so you could limit them by showing niche ads. Instead, promote new launches and offer discount codes. Either option will drive people back to your site by piquing their interest without driving them away. This type of retargeting audience tends to be largest with the lowest conversion rates. But, considering the average CTR for retargeted ads is 10x higher than regular display ads, this type of retargeting is a cost-effective evergreen campaign to run year-round. The final type of retargeting audience you should be using in Facebook ads might come as a surprise. It’s a list of people who’ve already purchased from your brand in the past. To show ads to previous purchasers, export your customer list. Facebook will match any details you enter to a profile, so you’ll need at least a name and email address for each customer. However, you should try and upload as much data as you can to support each profile. This will make your targeting more accurate, and your retargeting campaign more effective. You’ll then have the option to upload your customer file as a CSV, and match each column to tag (such as First Name and Email Address). 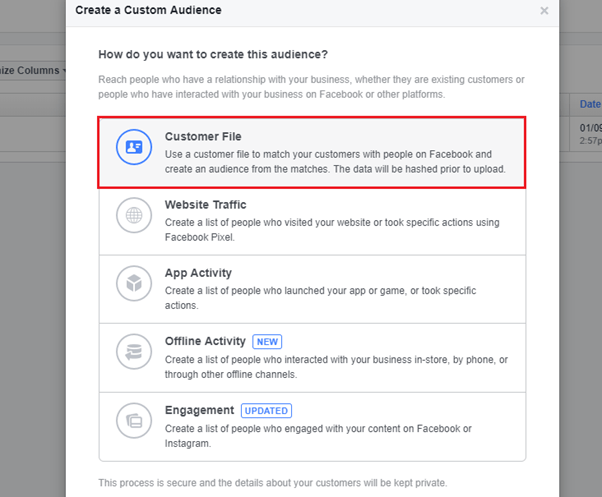 Once Facebook has found profiles for each of the customers on your list, they’ll be added to this audience segment and you’re able to start retargeting them. Many marketers brush off the thought of retargeting previous customers because they’ve already completed your end goal. They’ve made a purchase – we should be focusing our marketing efforts on new customers, right? 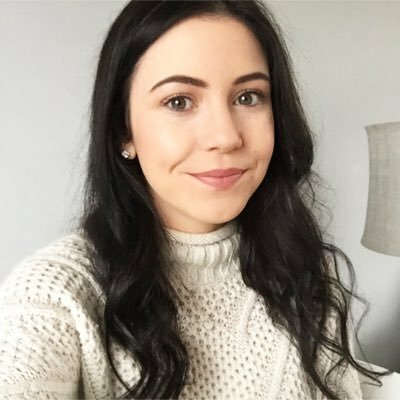 Taking a look at this data by Smile, we can see that after a person purchases something from your brand, there’s a 27% chance of them returning to your store and buying again. Plus, repeat customers are 9 times more likely to convert than a first-time shopper. Are you ready to retarget them on Facebook, now? 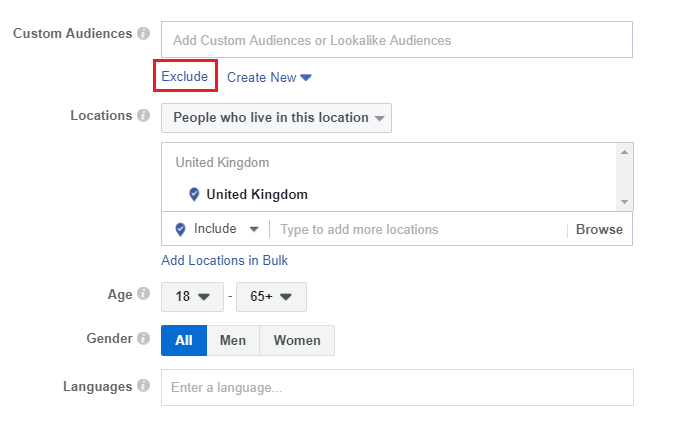 Exclude other audiences from your remarketing ad sets. What does that mean, exactly? Well, let’s say that we’ve created an audience of people who’ve engaged with our Facebook page. Joe Bloggs is on that list. We also made an audience of website visitors. Joe Bloggs is on that list, too. This would mean that Joe Bloggs would see both of your adverts. That might not seem like a bad idea, but it effectively means you’re competing against yourself. You’re using campaign budget to bid higher than your other ad sets, driving up the cost of each. 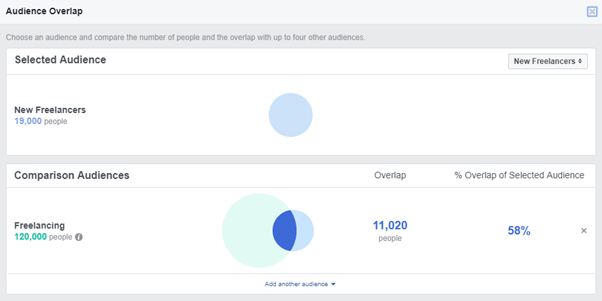 Facebook also offer a tool that can help you see how many of your audiences overlap each other. Using my example below, we can see that two of my audiences have an overlap of 58%. Failing to exclude the other audience from my other ad set would make my campaigns more expensive. I’m bidding against myself for the same advertising spot! 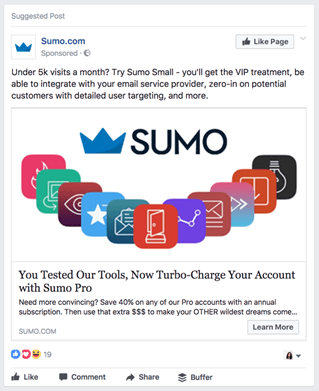 As you can see, Facebook ads that retarget people interested in your client’s product or service is a fantastic way to boost the conversion rate of your campaigns. 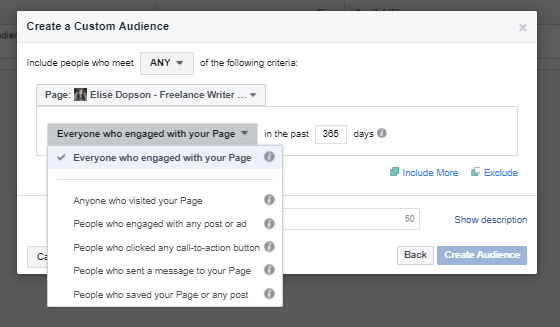 Don’t forget that each of your ad sets should be targeting a new audience, and make use of Facebook’s audience overlap tool to prevent wasting money. You’ll be seeing awesome results in no time, and your clients will be on the phone, praising you for their influx in sales!